The grand palace on the Côte D'Azur is a pristine white mansion on the tip of the Cap-Ferrat peninsula set amidst 17 acres of lushly landscaped gardens with panoramic views of the Mediterranean. It has been a legendary retreat for aristocrats, film stars, politicians, artists and writers for over a century, celebrated for world-class cuisine and unique luxury and elegance. Illustrious guests have included the novelist Somerset Maugham, Charlie Chaplin, Winston Churchill, Aristotle Onassis, Picasso, David Niven, Frank Sinatra and Paul McCartney, that tradition continues to this day with an elite international guest list. Recent expansion celebrates the beginning of a new era, while respecting the grandeur of the past, styled by internationally acclaimed designer Pierre-Yves Rochon. With the addition of a new wing, the hotel now features 73 rooms and suites, a new restaurant and world class destination spa. Also redesigned and relocated is the Michelin-star Restaurant Le Cap, opening onto a terrace with breathtaking sea views. Boasting one of the world's most spectacular wine collections, the gastronomic restaurant is headed by award-winning Executive Chef Didier Aniès, honoured as a Meilleur Ouvrier de France in the prestigious craftsmen awards. 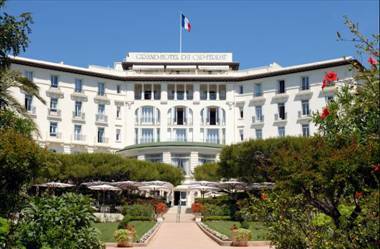 Grand-Hôtel du Cap-Ferrat is a 20-minute drive from Monaco and 30-minutes from Nice International Airport. The hotel is a member of The Leading Small Hotels of the World.